Be thrilled. At Viva Fortuna Beach - An All-Inclusive Resort on lovely Grand Bahama Island, the excitement really goes the distance. 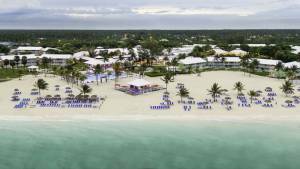 The fact is we're the only completely all-inclusive resort on Grand Bahama Island. And that means everyday is guaranteed to be a true adventure. Our 26-acre property is overflowing with date palms, birds of paradise, and hibiscus. This Spectacular 26-Acre Property Is Teeming With Lush Foliage, Wildlife And Palm-Tree Dotted Beaches. Enjoy Delicious Cuisine, Lively Entertainment And Themed Parties . Choose Thrilling Kayaking, Beach Volleyball, And Snorkeling Adventures, Or Can Simply Relax On The Beach.